March 2016 – Sig Nordal, Jr. The Beautiful view from citadella. ‘Suitable Farmhouse’ is a villa for a mid 40 year old couple who decided to return to their hometown to live with their 80 year-old mother. The villa is intended to provide two individual households under one roof because each party has been upholding their own lifestyles for a long time. Two main private spaces are designed as two independent studios and they are located in opposite corners of the house. The mother has an active lifestyle, where she frequently comes and goes, while the couple is more introverted and reclusive, preferring to stay home, cook, and watch movies. The mother enjoys spending the majority of her time tending to the garden, while the couple enjoys inviting guests with whom to cook and entertain. These two varying sets of influence help to shape the design of this farmhouse. 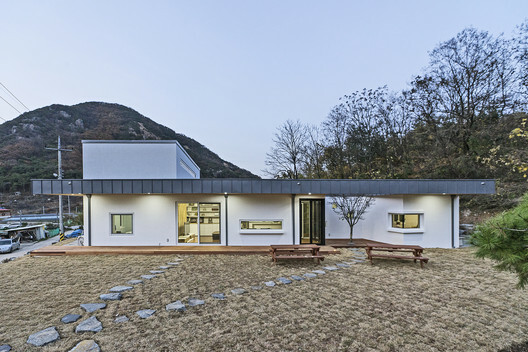 To address their different lifestyles, the mother’s main space is located near the entrance, so that she can access the outdoors without disrupting the solitude of the couple. The couple’s primary space is located more privately on the inner side of the villa. Common spaces, which connect the two households, are enveloped by a slim flat roof which conjointly ties the two together making the villa both geometrically and spatially complete. The client required a maximum 100m2 villa in order to get a financial support from their government, so the villa itself is designed as a compact and succinct house. The first strategy employed to achieve this is to create distinct zones for ‘service’ and ‘served.’ Service spaces directly serve the living plane: living/dining room and bed room. Thus, the service distances become short and convenient. By observing the client’s previous house and lifestyle, the architect found that this family lacked a comfortable environment, and adequate storage to make their home suitable. Therefore, this farmhouse incorporates both passive heating and cooling strategies, as well as generous storage into its design. Storage shelves, and other fixed-furniture are designed and integrated as part of the architecture. A small sunroom, a ‘warm roof’ and double-layered folding glass doors are incorporated in order to make this dwelling energy efficient and climatically comfortable for its inhabitants. A major challenge was to design useable outdoor spaces. Because of the compact size of the villa, 100m2, the residual site is almost 18 times the size of the home. The villa sits in the middle of the south-north oriented site, so the villa spatially divides the site into three distinct parts. Each piece naturally has its own unique character so the site design follows suit. Upon arriving at the site, the first impression of the villa is a garden of lush green vegetables. The mother loves to grow all kinds of vegetables, and the fresh greens go directly from the garden to their daily dining table. Behind the vegetable garden, a small space welcomes people before entering the main villa, which is referred to as the Entrance Garden. This is a flexible space the family can use for various events and activities. On the other side of villa, the scenery changes completely. A very modern garden with green grass and colorful flowers which grow naturally on the site are preserved. A panoramic window is designed to fit seemly to the picturesque view from the dining table. Despite the proportionally large site, all the outdoor spaces contribute to this project’s character by bringing nature closer to the family. Another challenging aspect was maximizing flexibility for the villa. Unlike city houses, a farmhouse needs plenty of space for the harvesting and processing of its produce seasonally. Thus, the villa was designed to have many expandable spaces according to occasional demands. For instance, the main kitchen inside the villa is compact, but a spacious utility room and outdoor facilities serve as a second kitchen. Following the logic of farming’s seasonal demands, the house also has occasional demands. As the family enjoys entertaining and cooking with friends and family, there is flexibility within the house’s social spaces as well. In addition, the garage was designed as a multifunctional social space by integrating parking with storage, loft and sub-kitchen. Advantageously, many kinds of events can take place in the combined garage and Entrance Garden because the multipurpose garage creates a spacious enclosed area both inside and outside. Naturally, this family loves to invite friends and family to BBQs, parties, and to make Kimchi together with all their neighbors.